Energy costs amount to 15% up to 50% of the total OPEX of deploying mobile networks in areas without power grid. Operators in developing countries, as those in the Sub-Saharan Africa region, need cost-effective solutions to face this issue, otherwise they will find it impossible to install new networks. When we first heard about Tesla’s latest innovation we were impressed. It seemed the perfect solution for what households need right now. But then we gave it more thought and realized that Powerwall batteries are also an answer for mobile operators. We now know they would make a great match with our SatSite base stations. A Tesla Powerwall battery offers either 7 or 10 kWh power output, is rechargeable with aid from solar panels and can be mounted indoors and outdoors. It also has a 10 years warranty and requires no additional maintenance costs. A single 7 kWh battery is enough for running 3 SatSite units. Recent initiatives, like GSMA’s Green Power for Mobile, have stressed the importance of deploying network infrastructures powered by green energy (in most cases solar) in developing areas and regions beyond the electrical grid. Since both equipments can be powered by solar panels we consider this pairing an easy and seamless solution, particularly in areas where connection to the electricity grid is an issue. It can also successfully replace diesel-powered telecom towers, reducing costs and environmental pollution. Not only does this solution work well in rural or isolated areas, but it would be a great fit for urban areas in developing nations that have an unreliable power grid. 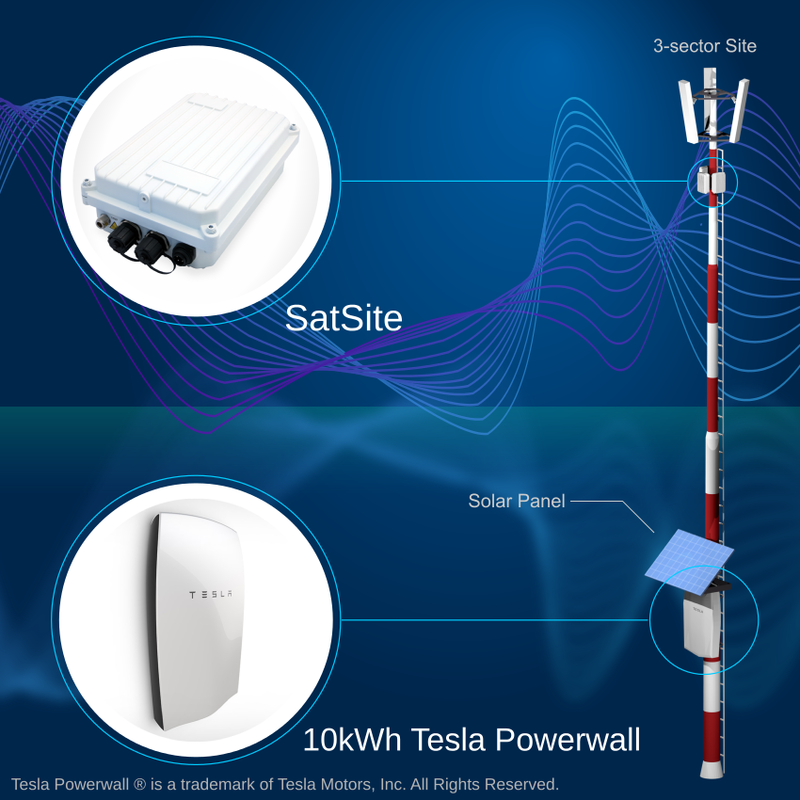 Cell towers equipped with SatSite base stations could use Powerwall batteries as a dependable and renewable backup plan in case of power outage. National blackouts affecting hundreds of millions of people, like those in India (2012), Turkey (2015) or United States (2003), will no longer restrict vital mobile communications if operators choose self-sustaining power alternatives.